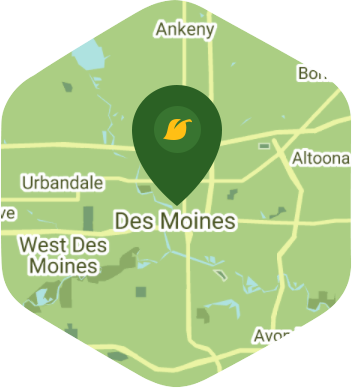 Book a skilled gardener in Des Moines. Backed by a total satisfaction guarantee and amazing customer support. The big gold dome of the Iowa State Capital Building shines brightly over the city of Des Moines. It is one of the city's most recognizable landmarks, but it is not the only thing that it is known for. People who call Des Moines home are familiar with Pappajohn Sculpture Park, the Des Moines Art Center, and Gray's Lake Park just to name a few. This city has more than a few attractions that are worth visiting during the weekend, but you won't be able to truly enjoy it if your garden needs some attention. Well you are in luck because Lawn Love is here to rescue your weekend. Just take advantage of our professional gardener service because we have the means and the manpower to help turn your yard around. Our independent lawn pros will do everything for you, so you can focus on enjoying your weekend and leave the work to us. We can trim your shrubs, mow your lawn, and take out your weeds for you. Our gardener service is all about versatility and delivering results, and with Lawn Love on the job you can rest assured that your yard will be in good hands. Call now at 515-305-3166 if you want your garden to get the best care possible courtesy of true pros. You can also ask for a free online quote.